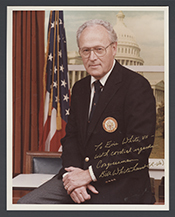 WHITEHURST, George William, a Representative from Virginia; born in Norfolk, Va., March 12, 1925; graduated from Maury High School, Norfolk, Va., 1942; B.A., Washington and Lee University, Lexington, Va., 1950; M.A., University of Virginia, Charlottesville, Va., 1951; Ph.D., West Virginia University, Morgantown, W.Va., 1962; United States Navy, aviation radioman in the Pacific Theater, 1943-1946; faculty, member, Old Dominion College, Norfolk, Va., 1950-1968 and 1987 to present; journalist, WTAR-TV, Norfolk, Va., 1962-1968; elected as a Republican to the Ninety-first and to the eight succeeding Congresses (January 3, 1969-January 3, 1987); was not a candidate for reelection to the One Hundredth Congress in 1986; is a resident of Norfolk, Va.
Whitehurst, G. William. Diary of a Congressman. 2 vols. Norfolk: The Donning Company, 1983, 1985.